Fascinating by its ornamental power, the necklace has been since time immemorial the absolute face of both women and men. Symbol of strength and power, it testified to stature and rank, but could appear as a protective attribute with magical virtues, like a talisman. The jeweller art has preserved the captivating and statutory character of this object laced around the neck, to the point of elevating certain creations to the rank of a work of art, set with stones the largest and the most precious. Today, the gold necklace is still one of the essential accessories of our jewellery box. 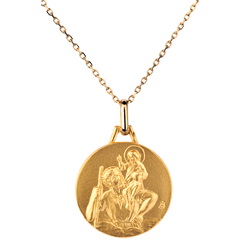 Offering or affording a gold necklace will always be the choice of an iconic gift, vector of pace and elegance. And from a practical point of view, it is also the ideal gift jewel, which, unlike rings, does not require to know the size or the metric of the person to whom it is intended. Our Edenly necklaces are indeed offered in a standard and comfortable size of 45 cm, adjustable on 42 cm for the finest necks or worn closer to the face, in the hollow of the neck. Diamond necklace, chain pendant, adornment ... What to choose? 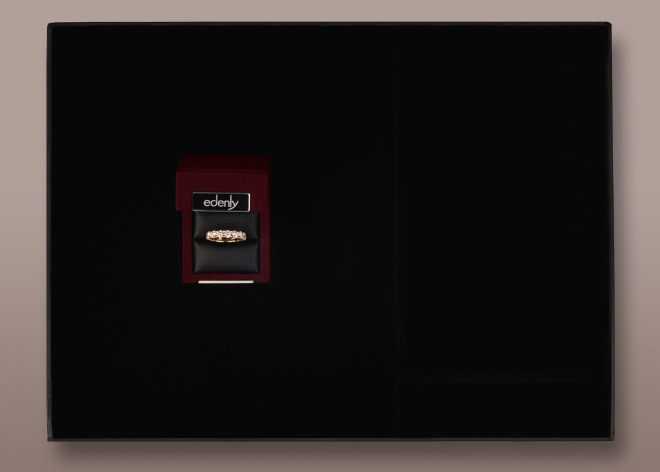 In white gold, yellow gold, pink gold or 3 gold, flexible or rigid, fine or large, with or without diamond, precious stones or pearls, discover the wide choice that Edenly offers you through its search filter. You will find both necklaces mounted on a chain and pendants (that is to say a pattern sold without the chain). For the acquisition of a chain, in addition to the purchase of a pendant, you can also choose the size of it. If you like and prefer the finery, make your choice within our various collections, which offer the declination in ring, earrings, and or bracelet. You will benefit from our offer of -20% on the second jewel. Finally, know that most of our jewellery is available in 9ct gold and 18ct to offer you a wider choice of prices. 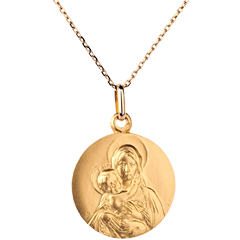 Edenly jewellery also offers a wide choice of baptism medals and crosses as well as several gold chains that will allow you to complete our range of pendants. All our jewellery is certified, delivered free and exchangeable and refundable within 30 days. How to choose your necklace? The necklace is distinguished by its style: a decorative and voluminous style (it is in this case the creative accessory of an outfit or a specific occasion, it emphasizes a look), or an intimate and discreet style (It is then more classic and personal). 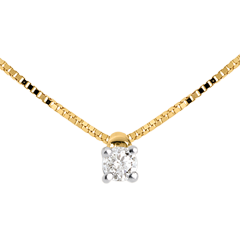 A solitaire diamond necklace, adorned with a few stones, will be in a classic style, timeless, that can be associated with any outfit and occasion, as the example of this model solitaire white gold > Conversely, the patterned necklaces testify to a search for originality, and are part of a more modern and creative style. This is the case of our collections Enchanted Garden, Oriental Eye or Fleur de Sel, which we invite you to view > The necklace is therefore a strong emotional, and even more so when we know that the essential model of jewellery remains the heart necklace. We advise you to discover our Necklace Heart Folding 3 gold >, one of our best sellers. Edenly is a brand of gold and diamond jewellery, created more than 10 years ago. 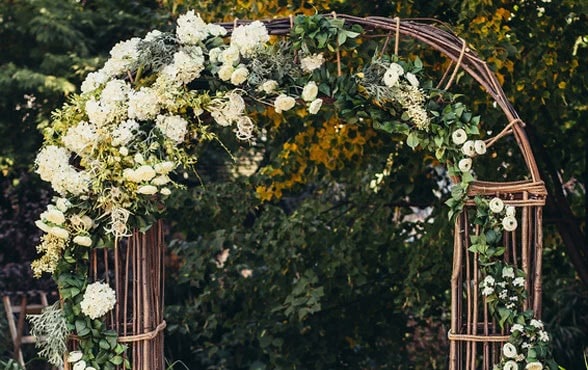 Today, with more than 100,000 customers across Europe and an unsurpassed satisfaction rate, Edenly has quickly established itself as a major player and true expert in online jewellery. Beyond the diversity of its models that it offers and an irreproachable jeweller’s know-how, Edenly also offers reassuring benefits such as free shipping, 2 years warranty, discount or free exchange, or the free refund for 1 month. These services and benefits reflect our desire to be an accessible brand, close to its customers, and a committed and ethical brand, partner of the great causes around women and childhood. 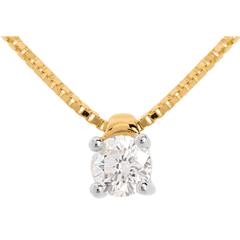 A pendant necklace in gold and diamonds is an understated gift, which is perfect for many special occasions: Christmas, Birthdays, Mother's day, wedding anniversaries, etc. 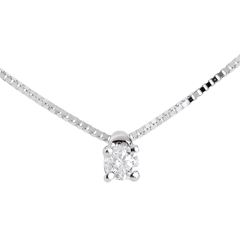 A diamond necklace is a perfect present for a wedding anniversary gift to celebrate the years in style. edenly also offers a wide range of delicate bridal necklaces to compliment the bride in her dress on her special day. Discover our selection of classic necklaces, such as a solitaire necklace, or our more modern necklace designs with pendants of many diverse forms: cross, heart, drop, etc. Your Edenly pendant necklace will be delivered to you in a very high quality, luxurious case.